Healthy, delicious, AND beautiful! 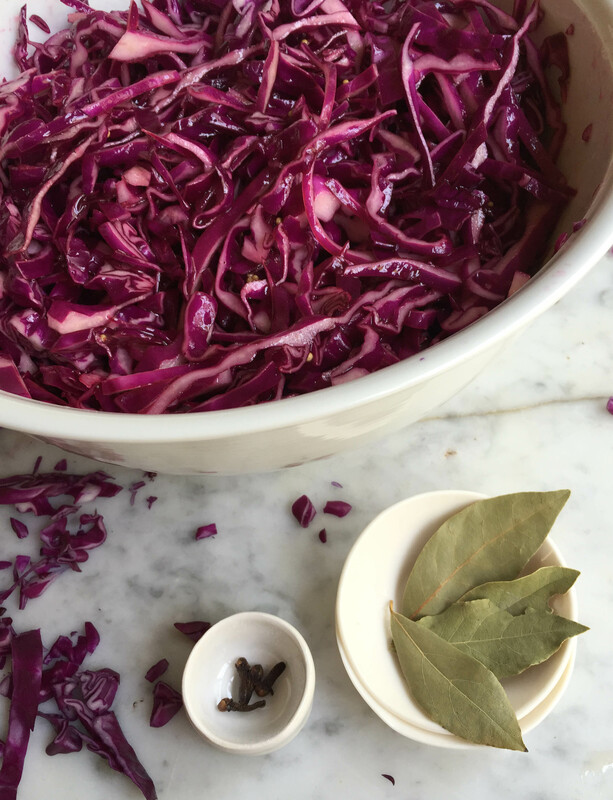 Red cabbage is a nutritional powerhouse. It’s a great source of Vitamin A, Vitamin C, Vitamin B6, and Vitamin K, as well as iron, fiber, and potassium, so it’s a great idea to have tasty and easy ways to prepare it. 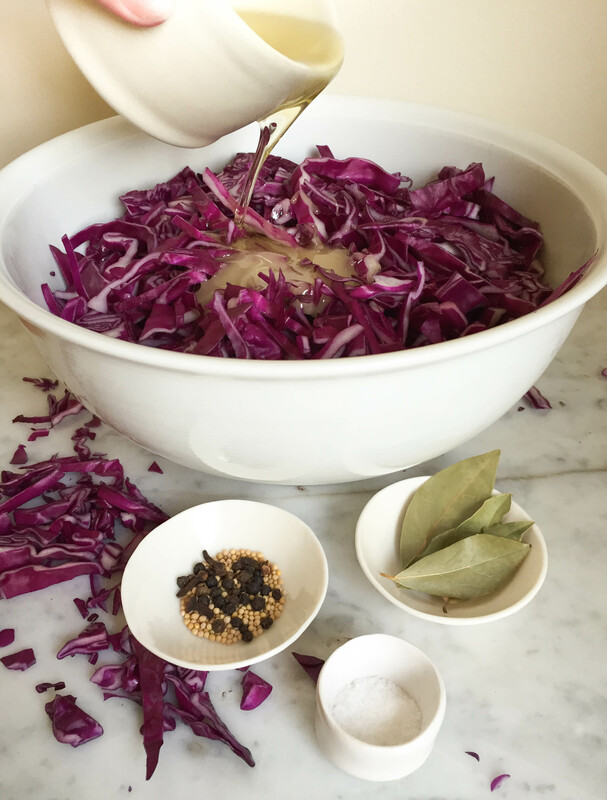 In Germany, red cabbage is most commonly cooked and served warm as a side dish for hearty meals (think pork roast, dumplings, and gravy), but it also makes a great slaw. 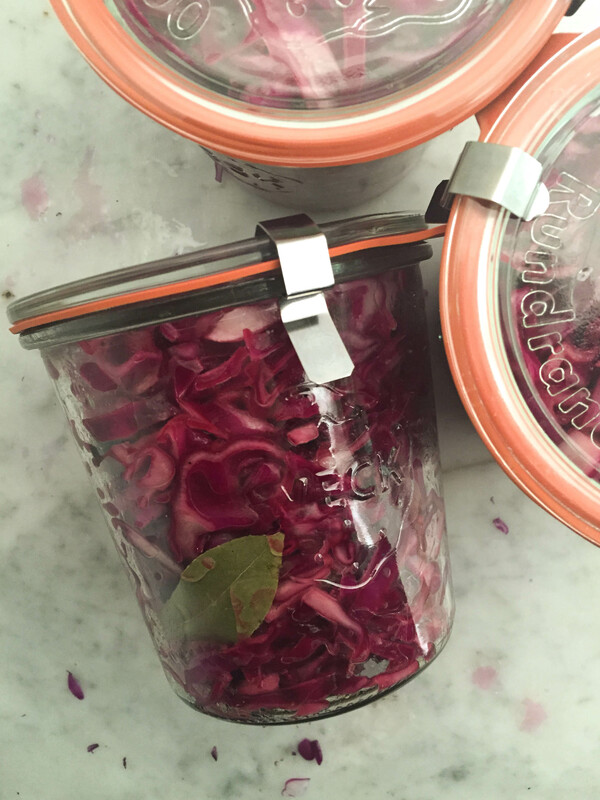 This quick pickled red cabbage recipe is one of my favorite basics right now. It takes only about 15 minutes to prepare, keeps in the fridge for a couple of weeks (mine has never lasted long enough to go bad though, it’s just too yummy), and it’s incredibly versatile. You can enjoy it plain, put it on a sandwich/burger or on tacos, or toss it with some arugula or micro greens for a simple salad. Red cabbage is also a great pH indicator. If you are interest in the science behind it, do a quick Google search, it’s fascinating. 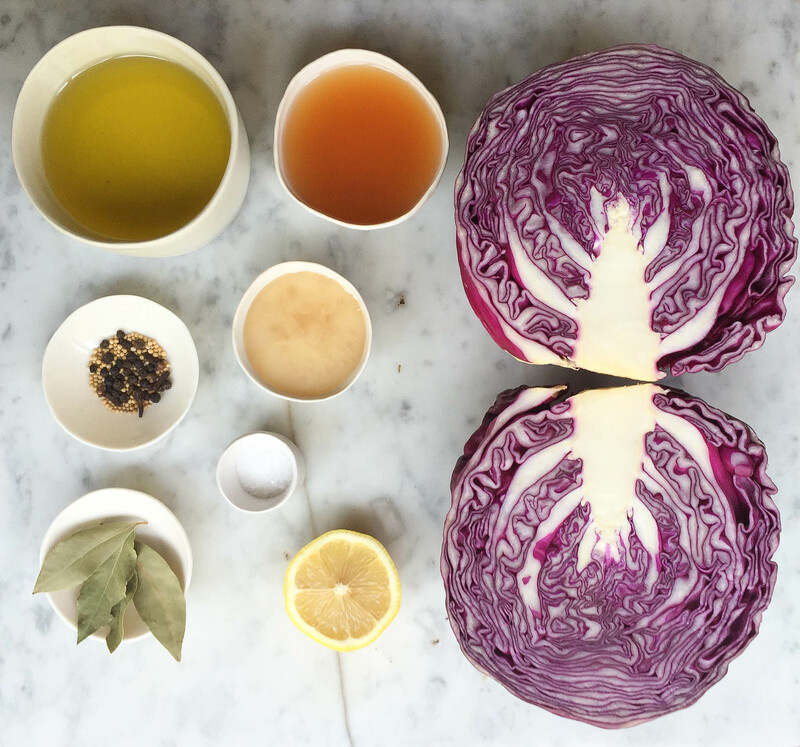 The pigment in the cabbage changes color when it comes into contact with acids or bases. 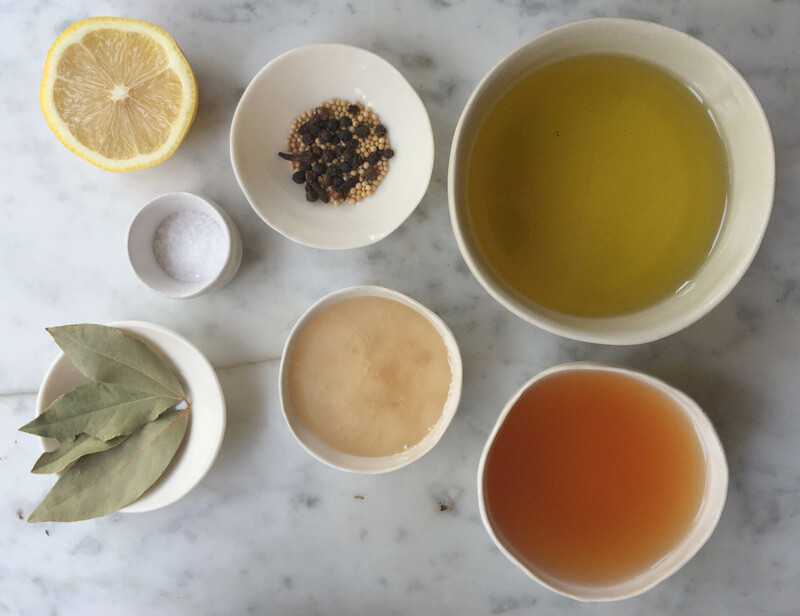 Acids (like the lemon juice you will be adding) change the color from purple to pink or red, while bases (such as dish soap or baking soda) will change the color to blue or even a bluish green. The changes are almost instant and just beautiful to watch. 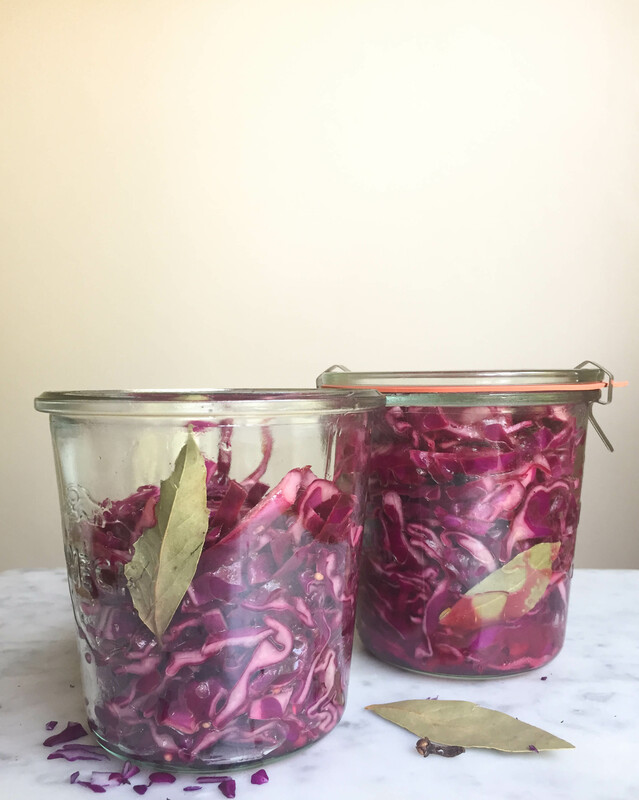 But now back to our quick pickled cabbage. Remove any limp or wilted outer leaves. Wash and dry the cabbage. Cut the head into quarters and remove the core. 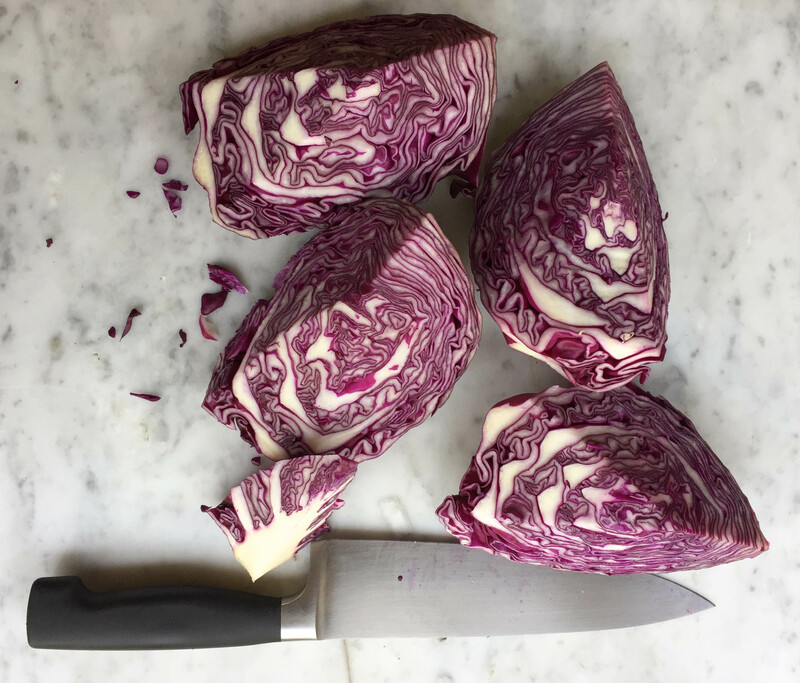 Finely chop or shred the cabbage (it’s very helpful to use a knife that is longer than the cabbage piece you are cutting) and place it in a large bowl. Add the olive oil, vinegar, honey, lemon juice, and spices (except bay leaves and cloves) and toss the slaw until well mixed. Fill the cabbage into the jars, packing it tightly. Add a bay leaf and two cloves per jar as you go. Add some of the vinaigrette from the bottom of the large bowl and close jars tightly. I like to keep the pickling dressing fairly simple, but you can always add other spices later. I also turn the jars on their heads every once in a while, to make sure the cabbage gets marinated in the vinaigrette evenly. Don’t freak out if it looks like the dressing has congealed in the jar. Depending on the temperature of your refrigerator, the olive oil can solidify after a couple of days (or even sooner). Simply let the jar sit at room temperature for about 5 minutes, then you are good to go. I can’t wait for you to try this. Let me know how it turned out.